Oracle Executive Chairman and Chief Technology Officer, Larry Ellison has demonstrated that Amazon databases are 20 years behind the latest release of the Oracle Database in the Cloud. 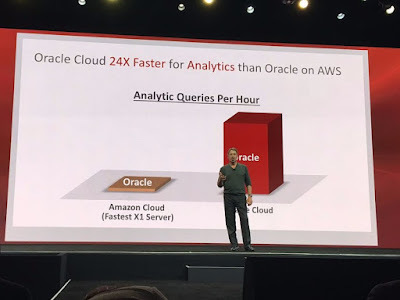 In his keynote presentation at Oracle OpenWorld 2016 in San Francisco’s Moscone Center, Ellison shared detailed analysis that showed that Oracle Database-as-a-Service (DBaaS) is up to 105X faster for Analytics workloads, 35X faster for OLTP, and 1000+X faster for mixed workloads than Amazon DBaaS. Ellison also showed that the Oracle Cloud is optimized for running Oracle Database while Amazon Web Services (AWS) is not. An Oracle Database running on the Oracle Cloud is up to 24X faster than an Oracle Database running on AWS. Ellison also announced the availability of Oracle Database 12c Release 2 in the Oracle Cloud with the launch of the new Oracle Exadata Express Cloud Service. This service provides the full enterprise edition of the Oracle Database running on the database-optimized Exadata infrastructure. Starting at just $175 per month, Ellison showed this Cloud service is lower cost than similar offerings from Amazon. With the launch of Oracle Database 12c Release 2 in the Cloud first, Oracle has demonstrated that the Oracle Cloud is the most optimized, complete and integrated Cloud for Oracle Database. The latest release provides organizations of all sizes with access to the world’s fastest, most scalable and reliable database technology in a cost-effective and open Cloud environment. In addition, the world’s #1 database includes a series of innovations that add state-of-the-art technology while preserving customer investments and supporting their transition to the Cloud. Oracle is the only vendor with true workload portability across on-premises and Cloud deployments. This helps ensure customers can continue to leverage their existing investment, keep costs down and easily benefit from the efficiency of Cloud. With proven continuous innovations and industry-leading performance across the entire platform from infrastructure to database, including support for mixed workloads, Oracle Data Management Cloud is the leader today and in the future.